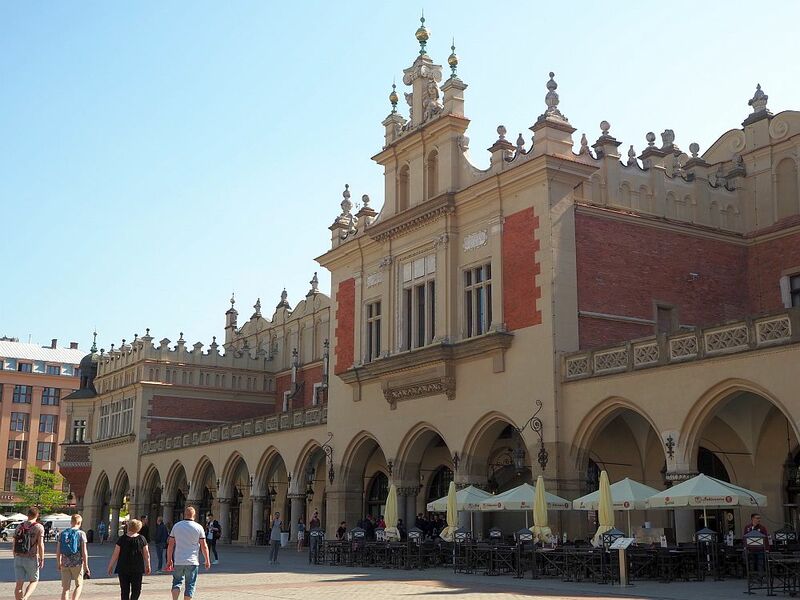 Krakow’s Old Town is centered around a lovely main square called Rynek Główny, which means main market. It dates to 1257, when it was rebuilt after the Mongol-Tatar invasions. Krakow Main Market Square forms the focal point of Krakow Old Town, a designated UNESCO World Heritage Site. In the center of the square stands the Cloth Hall, a long, rectangular building that offers shelter to market traders. Traders have sold their wares here since Krakow Main Square was established, but the current building, a Renaissance beauty, was built after a much simpler roofed hall burned down in the 1500s. Despite its name, the Cloth Hall wasn’t only about cloth: merchants sold leather, precious metals, spices, and so on, along with cloth. Today, still a market space, the Cloth Hall shelters traders offering souvenirs and crafts ranging from tacky to traditional. But, getting to the point, Krakow’s centuries of importance as Poland’s capital and as a trading city – it was part of the Hanseatic League – means that, archaeologically speaking, the city hides layers of history. And many of these layers lie under Krakow Main Square. Wieliczka Krakow Salt Mine isn’t just a salt mine! Excavating Krakow Main Square in the early years of the 21st century, archeologists uncovered a fascinating history of medieval streets, shops and objects. 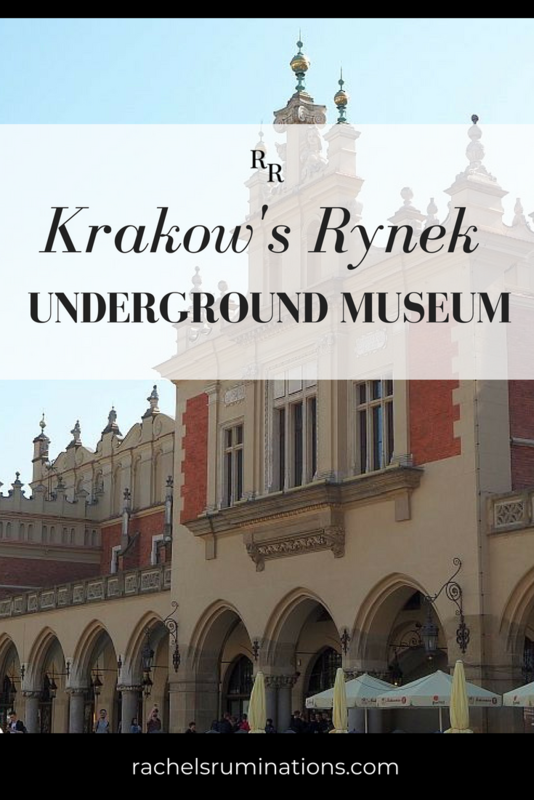 Today, under the Cloth Hall, the Podziemia Rynku (Rynek Underground Museum) offers a peek into that history, covering from about the year 1000 to the end of the Middle Ages. Descending the stairs, I entered a large room, darkly lit. Objects, structures, and explanatory signs dot the room, and it took me a while to figure out in what order I should view each exhibit. It didn’t really seem to be displayed in a particular order. Rather, exhibits are grouped more by topic than chronology, so I wandered through the museum, stopping at whatever displays caught my interest. 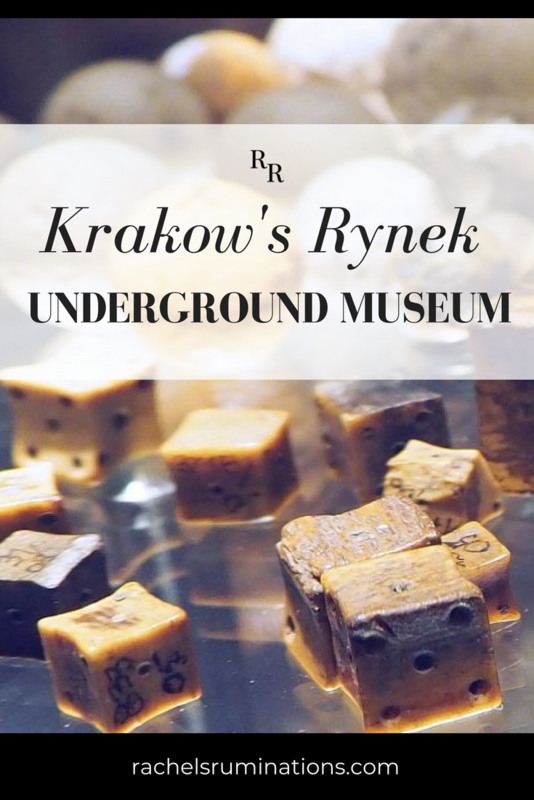 What can you see at Rynek Underground Museum? Some sections of the museum expose the foundations and cellars of the earlier market hall. In one section this involves a plexiglas walkway, allowing visitors to look over the sides at the walls and down at the floors without damaging them further. 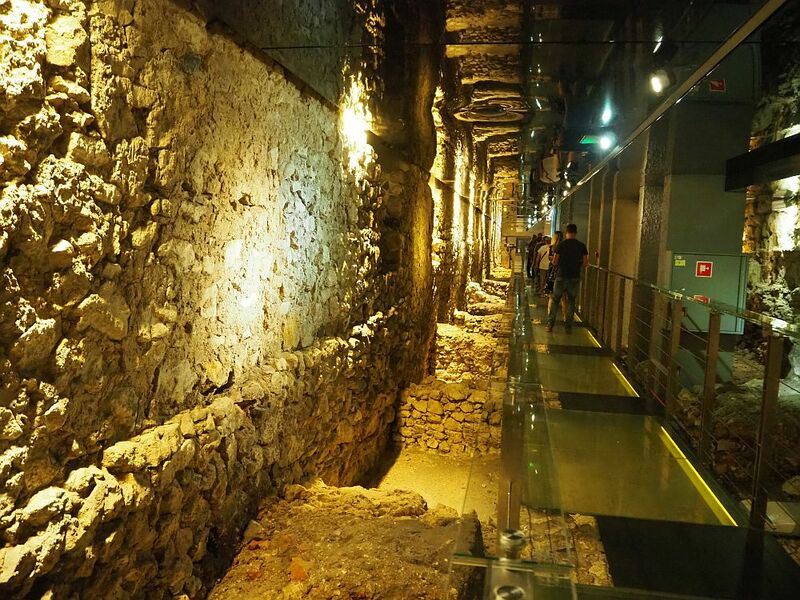 A long hallway reveals market cellars, walls and foundations in the Rynek Underground Museum. Objects found in the excavations are grouped, mostly by type or by occupation. Thus I could view items that a blacksmith might have used or produced in one section, personal articles like combs or clasps in another. A few graves, complete with skeletons, show, according to the signs, evidence of burial of people believed to be vampires. Exhibits like these – the ones that give insight into the people who lived here in that period – interest me the most. A collection of objects is less compelling. Replicas of a goldsmith’s and blacksmith’s workshop, complete with sound effects, helped me to imagine what life was like in medieval Krakow. If I’d had the time, the short films projected in the cellars under the current Cloth Hall would have filled out those impressions. 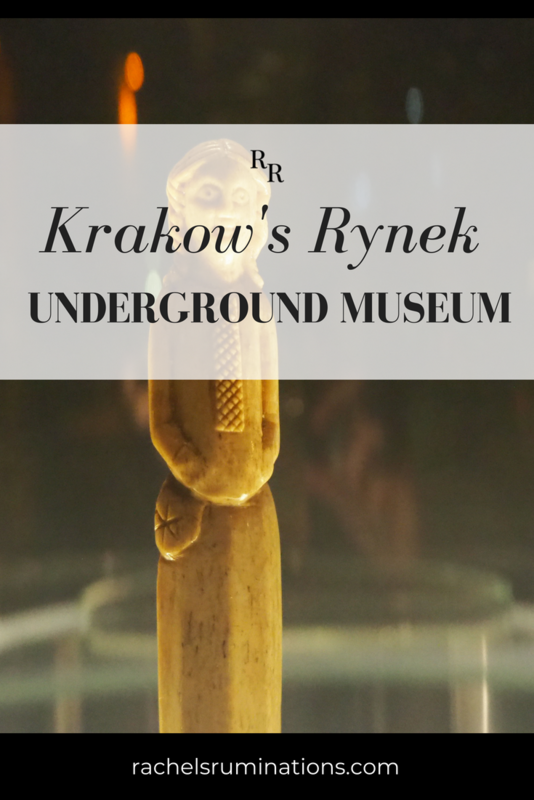 Various other whizzy features keep the Rynek Underground Museum interesting. Holograms, for example, allow visitors to view buildings from all sides. The lighting is dramatic and indirect, making it all seem a bit spooky, helped by a vapor machine. One of the cases shows a collections of playthings, like these dice. The whole museum reminded me strongly of the Medieval Museum in Stockholm: underground, built around existing ruins, darkly lit. The difference, though, is that this one in Krakow was somewhat less successful in helping me imagine life in that time period. I wanted an experiential, emotional understanding of medieval Krakow. It’s a contradictory comparison, though. This museum has far more real archeological relics, while the Stockholm version relies on replicas to create atmosphere. On the other hand, I enjoyed perusing the objects on display, so much like the things we use today. And walking along the cellars on the glass-bottomed walkway got me thinking: what’s beyond these visible walls and foundations? Only one side of Krakow Main Square was excavated: what more lies hidden under it? 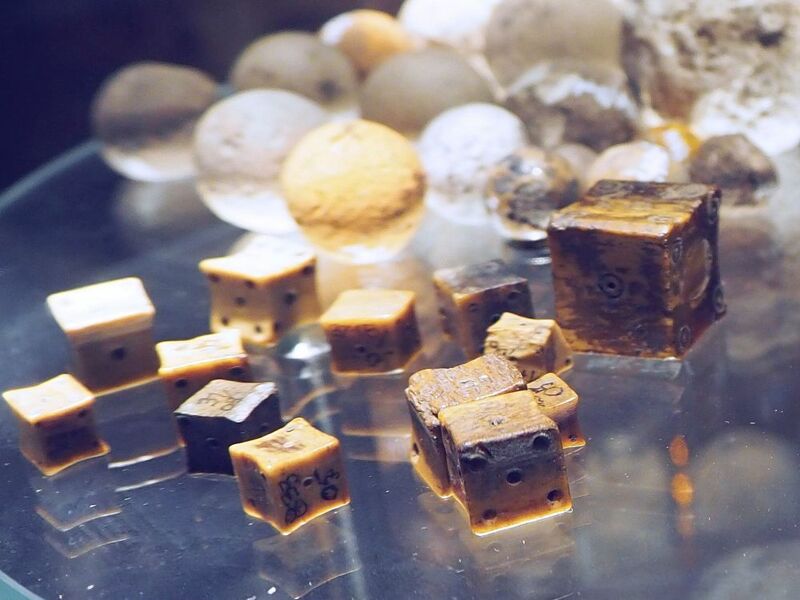 personal objects on display at the Rynek Underground Museum: buttons? clasps? jewelry? I should mention that the Cloth Hall is home to another museum as well, which I didn’t have a chance to visit. A branch of the National Museum in Krakow, the Gallery of 19th-century Polish Art is right upstairs. Since the museum limits the number of visitors, it is best to buy tickets ahead of time. The ticket office is at the Visitor Centre in the Cloth Hall on Rynek Główny, on the other side of the Cloth Hall from the entrance to the museum. I bought a ticket easily enough and walked around the building to the entrance, only to find a group of people queued up, waiting in hope that a space would open up. I think I was only able to buy a ticket because I was alone. Admission 21 zł (€5 or $6); free on Tuesdays. You can buy your tickets using this affiliate link, which means I get a small part of what you spend. In April to October, the museum is open on Wednesday-Sunday from 10-22:00, Monday from 10-20:00 and Tuesday from 10-16:00 (but closed the first Tuesday of the month). In November to March, opening hours are Wednesday to Monday 10-20:00 and Tuesday 10-16:00 (Again, closed on the first Tuesday of the month). The Gallery of 19th-century Polish Art has somewhat different opening hours: Tuesday to Saturday 10-18:00 and Sunday 10-16:00. Closed on Mondays. Admission is 20 zł (€5 or $6) and free on Sundays. The Cloth Hall ground floor, housing the craft stalls, is open every day except Monday from 10-18:00. If you liked this post, please share it! I have formatted the images below for Pinterest. Love this! I’m off to Krakow soon – I’ll need to make sure to visit. Good to know to buy tickets ahead of time, thanks! Enjoy! Krakow is a great city!